Whilst many people see fencing as a necessary requirement in a garden to simply mark their boundary, it does not need to be boring and purely functional. At Hepworth Timber Work we can assist you with any fence you may want, but why not go that extra mile and have something truly spectacular. Many customers are now looking at alternatives to the usual Close Boarded and Panel fencing seen in so many peoples gardens. Ideas like Canadian Western Red Cedar, treated Tongue and Groove sections, or commercial acoustic designed fencing can really accentuate a formal garden. Treated painted planed wood Palisades can give you that amazing contemporary feel. Matching side and driveway gates also help to complete the look. With vast experience in the fencing industry we are ready and able to work on any requirements our customers may need. From a simple fence repair to complete removal and renewal of an existing boundary, we can supply and install all variations of fencing that may be required. We can offer competitive quotes on the most common variants of fence including Panel Fences, Feather Edge, Picket Fence, Post and Rail fencing and Trellis work among others. Also we are well versed in Concrete post fencing, as well as any bespoke designs our customers may have in mind, and we also offer a rapid repair service for when the weather strikes! We can also supply and install a range of gates in varying sizes to suit any requirement. 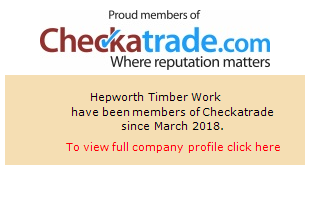 At Hepworth Timber Work we can put our hands to any design or idea, so please get in touch to discuss your requirements further!